The Cheesecake Factory: National Cheesecake Day Deals! 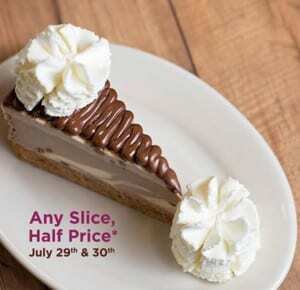 The Cheesecake Factory is celebrating National Cheesecake Day with two days of half-price Cheesecake! Stop by a local Cheesecake Factory on Friday, June 29, 2016 or Saturday, June 30, 2016 for half-price cheesecake. No coupon is necessary but the offer is valid for dine-in only and limit one per guest.